Did you miss the Pretzel Hat on eBay? Remember the pretzel hat that Princess Beatrice (Andrew and Fergie’s daughter) wore that was all the rage at the royal wedding? 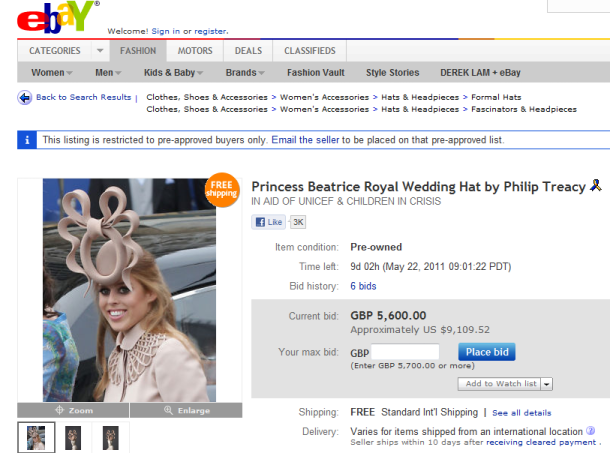 Turns out Princess Beatrice auctioned the hat off on eBay last week. The final total was £81,100.01, or about $131,000 in US dollars. As much derision and scorn as the hat generated, one thing is for sure: no other hat on any other head that day would have gone for as much! Kudos to Princess Beatrice for having a sense of humor about the whole thing, and for turning the publicity into good. All of the money raised from this auction will go to support The Little Bee Initiative, which helps UNICEF UK and Children in Crisis. If you missed out on the dress, it’s not too late! There are still auctions out there that support The Little Bee Initiative . Granted, the only item available right now is a Margaret Thatcher Nutcracker, which is almost as ridiculous as the hat!